Now, I'm very much a Feminist (especially as an avid Gender Studies major) and because of this I'm rather disappointed with how the media portrays beauty and body image. Perfect, poreless, skinny skeletons are obviously not a great image to throw at impressionable preteens or even full grown females for that matter. (and it's quite misleading for males as well) These archetypes are troublesome for the entire human population and yet we continue to don and dote them all the time, whether they be on television, in magazines, on billboards, in movies, or even on our Facebook news feeds. Subconsciously, these images become so ingrained in us and we are so influenced by them (perhaps subliminally) that we aspire to reach these unrealistic standards which are unhealthy and unreasonable! These photoshopped portraits are fake and phony! After pics of women (and men, who look completely fine the way they naturally are) are retouched and edited, they end up looking like awkward aliens with uncomfortable poses and disgustingly flawless features that are artificial and superficial. I say all this not to sound redundant, but to make the point that our world desperately needs more realistic, diverse, and reachable standards of beauty. With all of this being said, I was honestly a bit tom-boyish growing up. I rebelled in my own little secret way by refusing to wear make-up. I've always struggled with acne and I figured it would make my skin worse anyway, so why bother? My mom was never a great role model in my life, so I never learned the art from her and I thought it best to embrace the natural beauty of a clean, plain face. When I reached high school, however, my mind changed. I became a full on Fashionista and tried to wear cute outfits everyday, so I thought a splash of color here or there with my eye shadow would be a fun way to color coordinate my eyes to match my outfits. But I didn't exactly get the best feedback from friends. One of my best guy friends straight up asked me "Why do you match your make-up to all of your outfits? You should really stop." Another girl who I wasn't really close to got all up in my grill and said "You need to stop putting all of that on your face, it's why your skin is so bad" and then walked away as if nothing happened. I recall another day when I was feeling adventurous and I wanted to try a peacock feather look and when I showed the results of my dabbling to my foster sister, she responded by saying "You kind of look like a clown." These comments upset me and I stopped wearing make-up for years. Until I reached college. I had always dreamed of having flawless skin and I never thought that make-up could make this a reality. (or, at least the illusion of reality) And so I became inspired to learn how to properly apply make-up and use it to my advantage in accentuating my natural beauty. Keep in mind I did NOT photoshop either of these images at all! 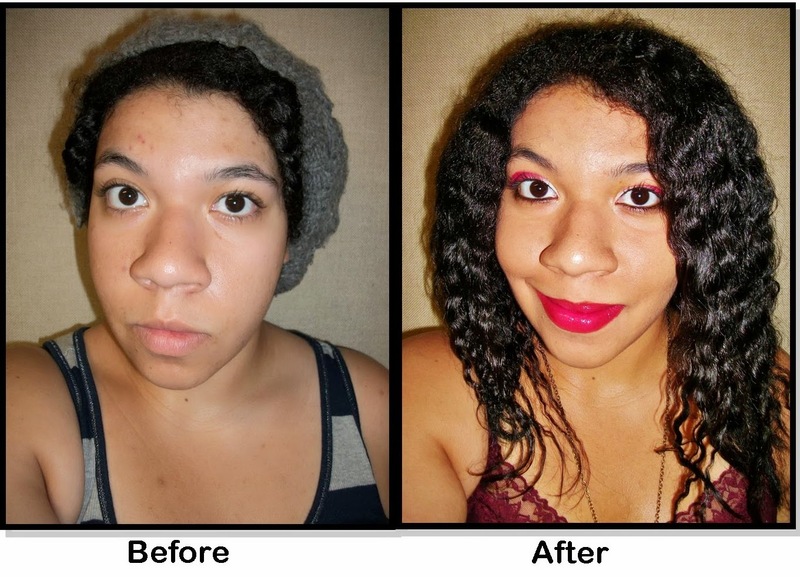 I did take the second picture in better lighting and I did mess with the brightness,contrast, color and sharpness of the pic, but they were very minor adjustments that didn't have much of an effect in altering my appearance. You have to admit though that make-up creates a significant change in the way I look. In the "Before" photo, you can clearly tell I have blemishes from acne scars, and if you really zoom in you can see my skin is very porous. (also keep in mind that I took these pics on a GOOD day. 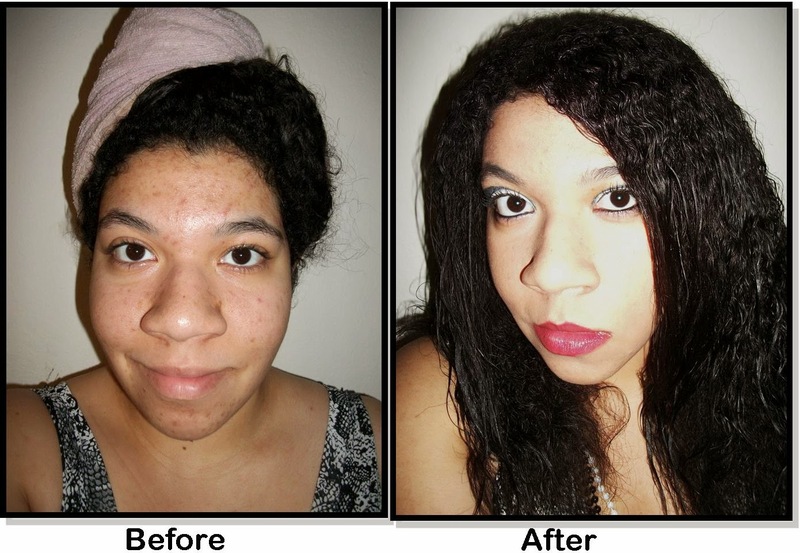 There are times where my skin is WAY more broken out than it was in these pictures) But in the "After" photo, I've made my skin look almost completely flawless, as smooth as porcelain and brought out my features with the bold colors. I guess my take away message here is that although we live in a society with ridiculous standards of beauty and outrageous expectations of what we should do and who we should be (for women especially), we can redefine these concepts and make them work for us! We don't have to be against things like make-up to seem down to earth and intellectual, but we can learn to utilize them as tools to enhance ourselves and celebrate femininity. Is make-up a necessity for me? No, not at all. But I wear it because it's fun and it makes me feel good (when you look good you feel good!) and that's all that counts. I think it looks pretty chic. You? Writing is like breathing for me. . .
A few days ago, as I had a conversation with a few friends over brunch in a dining hall, when asked about my affinity for writing, I openly said “It’s like breathing for me.” And it really is. My professor asked the class “Who here is a poet?” I cordially raised my hand. She asked me directly, “Then what are a poet’s biggest fears?” I answered, “Never having their poetry be read or understood.” She nodded her head in agreement and added to the list “Dying without their words being heard or never living on without them.” The last part of the earlier stanza in “A Litany for Survival” which I have highlighted reflects the fears of a poet, or of Audre Lorde herself. I am the shade of gray, a constant contradiction. . .
working to fight the stigma. and a warm and avid writer. ‘til restored, part by part. A mixture of all flavors. I rise from the ashes. I’m an advocate for purity. I still have my dignity. I have the strength to remain intact. can make them go away. . .
And finally see the light of day. to bundle up in your cocoon. a dreaded, loathed, and mottled moth. what dwells in which the shadows play. and graze the vastness of the skies. such wonders with the swiftest fate. 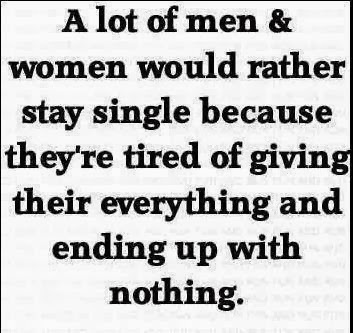 Because I've been single for the past 4 years, I've been trying on a new mindset. I'm learning to embrace what's within myself to find happiness and peace instead of always looking outside of myself, as our current society trains us to do. Even so, I can't deny the hopeless romantic that dwells within me and forever will. It's like a desire that isn't easily satiated. Today, I was looking through the stories I work on and came across a scene I wrote that almost brought me to tears. Some of my middle school friends would know what I’m referring to when I say that I’m working on a Sci-Fi/Romance dealing with futuristic superheroes. It was inspired by the cartoon series “Legion of Superheroes” that I watched A LOT during the first year of high school. Because I didn’t have friends over often and was very lonely growing up, I tended to romanticize cartoon characters. 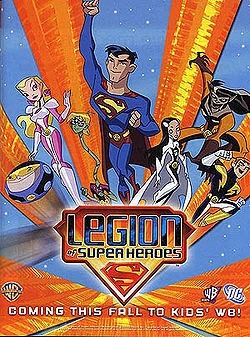 (Which I WILL definitely get into later on) Anyways, this cartoon series struck me and I guess I’ve always, sort of, aspired to be a superhero. Coming from a tragic background, surviving despite the odds and then working to make the world a better place. These are my life goals. I usually don’t go about hiding things from Fuse. She means so much to me, I’d never want to keep anything secret from her. Then again, I mean, you can’t really hide much from her when she can just tap into your brain and just pick up on it. I suppose it’s both a blessing and a curse, but she’s really good about keeping her powers to herself, at least most of the time. Well, I have to admit, reluctantly, that I am very envious of that power of hers. I just, I can’t seem to pick up on everything she thinks, even with my own abilities. But she, is just so. . . complex. I have to admit, as well, that she amazes me. I feel like she’s a genius and she doesn’t even realize it. But I just want to read her, you know? I want to get in that beautiful head of hers and understand what’s really going on. To really understand her. She says I do, but I don’t believe that, at least not every bit of it. I guess I just doubt myself too much, but oh well. It was about a month or two into her return that I decided to ask MAniac to make me the device. I told him my plan, how I really wanted to be able to read her mind, and no one else’s. He called her in for a couple of diagnostic tests and was able to get a layout of her brain waves and a trace of her neurotransmitters. He channeled her power into a piece of micro-technology. I can’t even really fathom how he did this or better articulate the exact procedure he did, but it fascinated me! He was able to invent a small, inconspicuous device that I could implant into my ear in order to be connected to her mind and read her thoughts, almost the same way as she could. Of course, this was very limited compared to her senses, but it worked well enough. It basically enhanced all of my natural instincts and helped me really get inside of her head, which was just what I had hoped for. It was insane! I could see into everything she was thinking. I had to be within a close range of her, but it worked! I did feel bad, at first, like I was violating her privacy, but I mean, it was only fair! She had this free accessibility into my thoughts all of the time, it was only right that I did too, at least for once! Okay, I sound a little resentful now, and I don’t really want to sound that way, so let me rewind for a bit. Picking up on her thoughts was rather difficult at first. It was like looking at a sign from really far away or in really dim lighting and not being able to make out the text. But if you focused and squinted really hard, you might be able to read it. It was like that. It was just little random feelings here and there, her opinions on things, etc. But over time, the device or my mental connection with her became so much more concentrated and amplified that I was able to really see into her thoughts and read them all. It was remarkably complex! I mean, I really don’t know much about how the mind works. Especially since I’m not inherently a telepath or empath as she and Cosma are. But when I saw into her mind, I was exhilarated, confused, devastated, and surprised. There were layers of thoughts, feelings, desires, ideas, . . . so many of them. I felt like I was robbing her of her innermost personal possessions. I was overcome with joy to learn just how much I mean to her. Sometimes, (and I’m ashamed to admit this too) I’m very skeptical about her truly caring for me. I know she loves me and would do anything for me, as she has proven time and time again. But I guess, because of my upbringing, I do have severe trust issues, and she’s even worked to help me see that. And I really hate to say it, but at times, I don’t know if I really do trust her. I mean, . . . okay, I really can’t say that. That’s not what I mean. . . erase that. I. . . I do trust her. With everything. With my life. But, I just don’t know if I can have faith in her love lasting for me. She’s so beautiful, intelligent. . . worthwhile. And I’m not just saying all of this to brag about her or because she might eventually read this. (Heck, she probably already knows that I was planning to come here and write this up anyway!) I say all this because it is true and she really doesn’t think so. She really doesn’t know! And I’ve seen that now. And it scares me. Besides seeing into how much she cares about me, I saw just how much she doubts herself and carries the weight of her past with her everywhere she goes. It’s enormously difficult and vast, but she struggles with it almost every day. I’m so proud of her for being so strong and resilient, but I feel so bad for her in knowing, now, that those things still affect her and have for so long. I guess I never realized just how hard her past was. I know how she got her powers and how the mutations occurred, but I guess it just never really sunk in that she did attempt suicide and almost committed it. Thank the forces of good that she didn’t successfully go through with it. Thank the heavens that the world somehow allowed her to keep her existence and brought her to me in this universe, in this time period. I am forever grateful. I also had to be conscious of how she could easily find out I was reading her mind. She’s clever and she can sense what I’m thinking and acting on very easily, whenever she wants or involuntarily a lot of the time. (I really don’t mind so much.) Because I could now read her mind consistently and continuously, I had to know just when to shut the ability off so that she wouldn’t detect it. I could tell whenever she was about to start reading my own, and after so much time with her, I contrived many ways of distracting her from my real thoughts. I say this ashamed as well, I really don’t want to hide anything from her. Fuse, if you’re reading this, please know that I love you so dearly and I would never want to hide anything from you. It’s just, some things, I know, can be misinterpreted and I don’t want you to get the wrong ideas from my scattered thoughts. I don’t even understand my own mind, sometimes. “You know very well what I’m talking about.”, she said with her eyes grimly squinting. “Fuse, babe, I’m sorry. . . I really am. . . I just, I just wanted to. . .”, she cut me off before I got the chance to finish. “Oh, Rean. I can’t get mad at you, you know I really can’t. I love you too much. . .”, she said, under her breath while shaking her head. I leaned in to kiss her and comfort her, to assure her that I didn’t do this out of spite, but simply out of curiosity. But I can understand the saying “Curiosity killed the cat” a lot better now. Her mind is, incalculable. Every little action I made triggered so many feelings within her. The gravity was immense. Whenever I did so much as brush her hair with my fingers, I could sense how much it meant to her. Just a touch upon her cheek, a kiss upon her lips, a stroking of her neck or a gentle tapping on her collarbone gravitated through her. I can’t say her touch isn’t similar for me, but I didn’t know how much it meant to her. She would have the sweetest thoughts like “Oh, thank God for Rean being here with me.”, “This is the happiest I’ve felt in years.”, “I’m so calm with him.”, “I’m so free with him.”, “This is my everything. I’m so glad I survived for him. I live for him.” Her thoughts brought me to tears, at times, because they were so sincere. She really loves me, and I’m so blessed to have her love. I thought all I had to look forward to was a life full of more suffering and torment. But I am so gifted to have her, and I’m more than happy to know that she can feel the same way towards me. My little mind reading adventure really turned out to be a tremendous learning experience. Besides her feelings of warmth, content, ease, and rest in my presence, there were many of fear, sorrow, angst and misery that she covered up and tried to hide, not from me, but from herself. I never knew she was so insecure! This explained so many things. It gave me reasons for why she covered up her left eye brow with her hair, why she looked down and put her hand over her cheek when anyone else complimented her after saying “Thank you.” Why she buried her face onto my chest whenever she was down or in need of my affection. But there weren’t only simple insecurities that she kept inside, but deep pigments of pain. She thought about how her step-mother threatened to kill her, or how she tried to runaway several times but could never find the strength to. Or how she stayed in placement for almost a year, not knowing when she would leave or where she would end up going. The poor thing was tortured for so long, she didn’t even have significant time to internalize these things until now, and she was just sorting them out for herself to understand. I may not be the smartest man, especially compared to someone like my own father or MAniac, or even Magnetic Maverick, but I can see what makes her tick now. And I’m very thankful for this insight, but also very aware, now, about what’s she’s been through, and I cherish her so much more. I remember lying down with her, holding her down as she sobbed uncontrollably. She had just finished solving a case with the rest of the team and saving a little girl from a murderer on a tirade and it reminded her of how her step sister cut her forearm with a peri knife because she didn’t want to play with her. It sent shockwaves of frustration, resentment, and isolation throughout her frame and I lied there, holding her, wishing I could go back in time and prevent it from ever happening in the first place. These memories resided in her head and revealed themselves at times of their choosing like flashbacks in a movie. I can’t say it isn’t the same for me, at times. But a majority of my troubles are forgotten or gone, or at least, I don’t really ruminate, but she does, and not by choice. Her feelings turn inward, she blames herself for everything that goes wrong. I, on the other hand, I blame my aggressors and obtain so much anger towards them. She, however, only harnesses anger towards herself, which kills me inside to know. I paid careful attention to what my movements did to her, what put her at ease and what quelled her pain. It was the least that I could do. I held her in my arms, close to my body, her back against my chest. I placed one hand on her cheek to dry her tears, my lips on her neck to kiss a line along its curve and the other hand around her waist from underneath her side on the bed. I know that this always soothes her, no matter what grave state she may be in. Her breaths became much more coherent, now, and her thoughts less muddled. I changed the subject very gradually because I didn’t want to undermine her troubles, but I wanted to get her mind off of the hurt. She paused to study me and placed her right hand on my lower cheek, just above my jaw, very softly. “You should know, Rean. You should just always know.” She kissed me and left the moment there. She is so kind. She’s always so kind to me. I don’t think I’ve ever known such kindness. Perhaps I once did from my mother, who is long gone now, of course. I never really got to know her, but I remember fragments of my childhood with her, and she was of a very kind and gentle nature herself. But every day, I thank the Lord or the forces of nature for delivering me this angel on earth. Fuse is my light, and that’s an amazing thing to witness and to have after years of living in the dark. Getting to know about me is easy when looking through the class work I do. I get many outlets to share a bit about my experiences with the teachers and colleagues I have. I call myself deprived. I do not care how harsh the word may seem, or about people’s reactions. It entitles them to the truth. Some claim that I’m exaggerating or pretending by using this term, but unfortunately, I’m not. I have always been an under-represented and underprivileged person, struggling to obtain the very things I require for survival. I live without the luxuries of a car, the internet, air conditioning, cable, a microwave, etc. Besides these, basic necessities are had to come by. These sorts of things are taken for granted by most others. I have to do without them. I differ from the norm because they possess many items that I simply cannot afford. There are so many opportunities that I have missed out on and so many things that I have never been exposed to that regular people have. For instance, I’ve never been to a beach, aquarium, or zoo in my entire life. This forces you to lose interest in such places because you start to feel as if you’ll never receive the chance to go anywhere, ever. Strangely, it sometimes affects me in a positive way because it makes me more independent. But at what price? Society refers to people like me as “lower middle class.” But that is just a euphemism for the “working poor.” Or, the “working poor” can just be a fancier phrase for “those who are immensely poverty stricken.” What about a household where there isn’t any income at all? Where everything is supplied for by the government and therefore limited? That’s what I come from. Maybe I am blessed to not be in the same situation as a homeless man or a starving child in Africa. Thank God for that. But does that really make me any luckier? Not necessarily, because you cannot compare the pain that hardships may inflict upon a person. I may not be in their places exactly, but I am one step away, on the verge of falling into a similar situation. I live with the constant fear of whether or not I’ll be going home to a cooked meal or crumbs from leftovers. Whether or not I’ll be going to a grocery store for food, or a local food bank. If one bill is too high or if the rent goes up, I might just be on the street. What if the landlord decides to sell the house? Then I’ll be homeless for sure. Hopefully, none of that will happen. But I always have to be prepared for it if it does. By stating that I am deprived, I do not wish to be pitied, just considered. I want “normal” people to at least acknowledge how far I’ve come and to be aware of how hard I’ve had to fight for the many things I do have. I can’t even feel comfortable enough to ask someone for something without feeling the guilt, shame, or embarrassment of being deprived. I wouldn’t want one to think I was begging or insisting. Perhaps I’ve been blessed, in a weird way. I make up for the lack of money for living expenses by dedicating myself to the intelligence, talents, and skills I have. Maybe being deprived now is a lesson I must learn so that it will aid me in future experiences. But none the less, that doesn’t change what I’ve been through or what I’m currently facing today. I’m still under-represented and underprivileged teenager who’s not finished fighting. Don’t take me for granted. Before I graduated from high school in 2011, I applied to several colleges with hopes of getting into my dream school, UCLA. I was derived from an emotionally abusive background, where my mother was over-protective, paranoid, aggressive, unsupportive, and verbally abusive. I lived with her along with my physically/verbally abusive uncle and my ill, vulgar grandmother. They raised me in a three bedroom house that was paid for by government housing and they each had either welfare or SSI. I was mistreated often, I didn’t have much freedom or many privileges, and I didn’t have enough money to afford necessities. (i.e. food, toiletries , the internet, school supplies, etc.) My only source of transportation was a bike or the option of walking. Because of this environment, it was hard for me to focus on school work, and I was often depressed. At the age of 15, I grew very tired of my life, so I contacted social services. After 3 months of investigating my living conditions, they observed that it was unsuitable and removed me from the home. I’ve been in foster care since. Initially, I had no problem with the placement. I enjoyed my new found freedom that allowed me to spend time with my close relatives and friends, the encouragement and support I was given to attend college and participate in extracurricular activities, the home cooked meals served for dinner every evening, having access to the internet from home, receiving a bus pass, and the money they provided me with that enabled me to finally afford necessities. I had never had any of these things, and it was refreshing to acquire them for the first time. However, I was overwhelmed with appointments and meetings that I constantly had to attend with social workers, counselors, and therapists. I had to juggle all of these along with my homework, after school activities, chores, and social life. Though my life is better now, I always have this busy schedule. It makes me tired and stressed often, and I may not always be able to perform at my best, but I make an effort none the less and I am still able to manage because I recognize that this is the most convenient situation that I can currently be in. In the future, I look forward to enrolling into college and hopefully pursuing a career in the fields of writing, music, or fashion. Music, for me, has always served as a pleasant distraction from the hectic world I live in. Writing has always been the way that I express and release my deepest emotions by turning them into poems, songs, or stories. And I am a firm believer in the phrase “when you look good, you feel good”, which is why I’m so adamant about fashion. I dream of becoming a singer with my own fashion line and an author who has published five books, including a novel, a book of short stories, my autobiography, and a collection of poetry. I plan to emancipate from the foster care system and live by myself or with a close friend. The reason for this is the strict structure and routine of my foster home, which is secure, but sometimes uncomfortable for me. I feel that I will be happier as soon as I’m on my own and independent. The hardships I have faced as a child and throughout my life have caused me to be a very strong, dedicated individual. Though they were difficult to overcome and still are, I am thankful for them in a way, because without them I would not be as unique or powerful as I am today. I am glad that I have survived through them and that I now can call myself a fighter who has witnessed a tremendous amount of conflicts in my life and has still been able to benefit from them, which is a statement that few are qualified to make. Journal #5: The Poverty Line and Class Associations; How they affect our lives. After reading about Karl Marx last week, I was rather surprised at learning about his personal life with his wife and children and how they were impoverished. I guess it makes a lot of sense, after looking at his work with Socialism and his distinctions of the bourgeoisie and the proletariat, that he would come from a lower working class background, hoping to see political change and economic equality. Furthermore, after reading David Newman’s Sociology Chapter 10, I thought a lot about my own socioeconomic background and current class standing. According to Newman, “In 2011, the official poverty line for a family of four –two parents and two children – was an annual income of $22, 113.” (160) Then, looking from this to Paul Fussel’s nine levels of American society, Destitute encompasses the working and non-working poor, or in other words, those potentially receiving public assistance. It was refreshing to hear the professor’s class background today in class, and after reading these works, I had a better understanding of my own. I grew up in a house with my mother, grandmother, and uncle. We rented the house and received assistance from Housing and Urban Development (HUD) or otherwise known as section 8. My uncle and mother did not have formal jobs, but my mother received welfare and food stamps for having me as well as care providing funds for taking care of my grandmother while my grandma received Social Security and my uncle received Disability. At this time, each of them were receiving around $800 a month (this includes the food stamps and other non-cash benefits), which put us around $28,800 a year, just six thousand above the poverty line. But as I reached my early teens and my grandmother passed away, we no longer received her Social Security check and my mother’s care providing funds cut off, which put us at around $16,800 a year, way below the poverty line. So it’s quite clear that we were pretty much settled at Destitute, and my families mental health statuses and eccentric behaviors didn’t help put us any higher on the social ladder. As far as I was concerned, we were pretty poor. We often went to thrift stores to buy clothing, took advantages of sales, bargains, and the clearance section at most local retailers and made trips to food banks, churches, and homeless shelters for extra food. To the outside world, strangers, or friends that may have entered my house on occasion, we probably seemed well to do with our furnishings, cleanliness and abundance of records, cds, computers and bicycles, but most of those were hand-me-downs from old friends, relatives, neighbors, or collected from yard sales. We were barely making it by each month. At the age of 15, I was then put into foster care, which again, is yet another lower class setting. However, I felt like I had hit the jackpot! Receiving a clothing allowance of $50 a month along with $20 for miscellaneous purchases was well over what I was used to, though it was quite a step down for a couple of my foster siblings who came from wealthier homes and families. After realizing these class positions I was derived from, I was then intrigued to read this, “Only 3% of students in elite U.S. universities come from the poorest quarter of the population, and only 10% come from the poorest half.” (Newman, 163) As UCLA is currently ranked one of the best colleges in the world, I think I can declare myself as one of those students who falls within the three percentile. Though it saddens me that social mobility is infrequent because of the inequalities in our socioeconomic system and that only a measly 3% of the poorest students get to go to elite universities, I’m also extremely relieved and proud to know that I am one of the few who has managed to move a little higher up within the class levels compared to where I have originally come from. Paul Fussell, Class, ch. 2, "An Anatomy of the Classes" Touchstone, 1992.